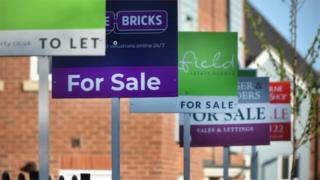 UK house prices picked up last month, rising at the fastest annual rate since November, according to the Halifax. In the three months to August, prices climbed by 3.7% from a year earlier, up from 3.3% annual growth in July. However, the monthly change was just 0.1%, leaving the average cost of a house little changed at £229,958. Russell Galley, managing director of the Halifax, said low interest rates and a "constrained" supply of homes for sale were supporting prices. He added that household finances were being helped by "a low unemployment rate and a gradual pick-up in wage growth". The Halifax's latest survey diverged from that of rival Nationwide, which last week suggested annual UK house price growth continued to slow over the summer. The building society said that the annual change had fallen from growth of 2.5% in July to 2% in August. Jeremy Leaf, a north London estate agent and former residential chairman of the Royal Institution of Chartered Surveyors, said the data offered "a mixed message". "Prices are rising more slowly on a monthly basis but accelerating when annualised," he said. "What we are finding on the ground is a market largely stuck in neutral - shortage of stock is supporting modest price increases, particularly outside London." Mike Scott, chief property analyst at Yopa, noted that the number of first-time buyers has more than doubled since its low-point in 2009, and "is now approaching the level seen during the boom in 2006". "Since first-time buyers underpin the whole housing market, this suggests that the market will continue to perform into 2019, and may even improve further," he said. How affordable is rent in your area?